Confession: I don’t know everything. But these were the questions I have been getting as well as things that were important to us. Write Your Book In my mind, this seems like the first step… but I guess you could do your illustrations first. Pick Your “Trim” Size This basically means to pick what size you’d like your book to be. You can check out the sizes here on Create Space. You can use the drop-down menu under Member Order Calculator. This is also helpful because you can see how much a particular size and number of pages will cost. I would probably choose a standard size. Draw it on the Computer We actually bought a drawing tablet. It’s like a pen and paper that transfers onto your computer screen. My husband did all the sketches in Adobe Illustrator, and then I traced, colored, and illustrated the pics. You could also draw in Photoshop. Our drawing tablet came with a program as well. Paint, Draw, Then Scan This is another beautiful way to illustrate your book. Our friend wrote Love with All My Might Her illustrator used watercolors then scanned the pictures into Photoshop where the words were added later. How Long Should Your Book Be? This can be tricky. I wanted to write another short children’s book that would be about 16 pages long… but Create Space books have to be at least 24 pages. On the long side of things, there seemed to be jumps in prices when you reached certain page thresholds…it wasn’t like the cost of the book was equally divided over the number of pages. It seemed to cost a certain amount; then you could go up a number of pages and it would suddenly jump in price. You can play around with the cost calculator here. Color or Not? For kids books, color is probably the obvious answer. But if you’re looking to write more of a chapter book, the black and white printing costs are amazing. It seems that you pay the same price for color printing regardless of how much color is on your pages, so you don’t get a price break if only half the pages have color. There may be times when it would make sense to do half color pages and half black and white, but from my experience publishing with Create Space isn’t that place. Submitting Your Book This might be your problem step if you’re not expecting it. You can’t upload each of your pages separately. All of the pages in your book need to be in one long pdf. We did this by taking all our Illustrator files and combining them in InDesign, which is Adobe’s product for book layout. I’m sure there are other options, but it’s worth figuring that out before you start. You don’t want to get right up to the finish line and find yourself unable to submit your book. Spend Time on Your Cover You upload the cover separately. My recommendation: spend more time on the cover! Although it may not be fair, we always judge books by their covers :) We spent a lot of time on our book’s cover. 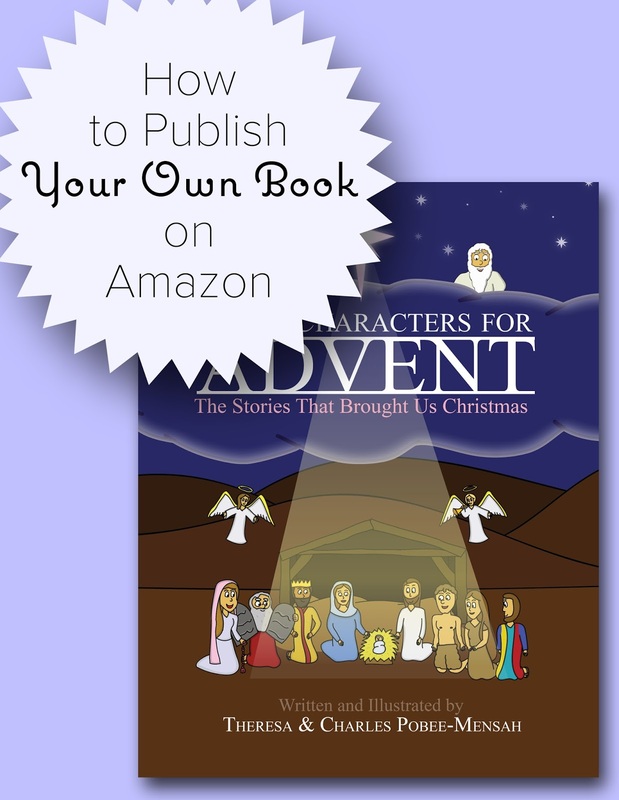 Not that we weren’t devoted to the entire process, but the cover had to tell you, “This is the best book to help prepare your kids for the coming of Jesus on Christmas.” You Must Buy This Book So it was worth a bit of extra time and attention. The Review Process Once you’ve finally finished, you’ll upload your file to Create Space. Then comes the dreaded review process. It really isn’t that bad; it just takes about a day to see if there are any problems with the book. Amazon does not proofread!!! It simply checks to make sure your words aren’t running off the page. They check the quality of your file to make sure it won’t pixelate when it prints. You cannot skip this step, so if you’re running behind then yes, you will be sweating it out waiting for the review process to be done. Ordering a Proof Fun news! You can rush ship your proof so that you can see a test copy of your book even sooner. The first thing we noticed when we got our proof was that the colors seemed to print darker than they appeared on the computer. Our night sky seemed black instead of blue, etc. So we lightened up some things. Also, we scoured the book and found a few typos. Then we made corrections, re-uploaded it, and waited for the review process again. We did not order a second proof at that point. We were selling a book for Advent and it was only a few weeks away. Plus, we didn’t make any huge changes, so we just went with it. How Should You Sell the Book? I truly don’t know the best way. We’re still debating how to sell our book for this upcoming year, but here are your options and how we did things last year. Order the Books and Sell Them Yourself Create Space lets you, as the author, buy the books at a discounted price. You can then sell them yourself, to bookstores, etc. If you buy the book and then sell it directly yourself, you will be making the most money. Obviously, you should check out the laws where you live for selling things. Create Space Store This is option number two for earning the most money on your books. Create Space gives you higher royalties on books sold in the Create Space store. This is basically an online store where authors can sell the books they self-publish. The advantage is that you do make a higher royalty. The downside is that most people are not familiar with Create Space, so they might be more hesitant to purchase something on that website. The final choice is Amazon And the cheering begins! Everyone on the planet knows about Amazon. Most love it, and probably half have Amazon Prime, so they get free two-day shipping. except me of course :( While that may be a slight exaggeration, Amazon is a well known and trusted place. If you’re buying something from Amazon, you don’t have the extra hurdle of having to enter your credit card information each time. It’s an easy yes from “I want this” to “I’m buying this.” I’ve even heard Amazon being called a ‘marketing machine.’ If your book is doing well on Amazon, the website may start recommending it to others. The downside: your royalty is substantially less than if you are selling the book yourself or through Create Space. This is the pickle… if you sell it on Amazon will you sell more books, hence making more money overall. Or will you sell the same amount, hence wasting the extra money it “cost” you to sell it on Amazon? I go back and forth on this… eventually you just have to try something. At this point we are selling our book on Amazon, so you can see what that looks like vs our friend’s book on Create Space. What was your experience? Did Amazon carry more comfort for you? Or was it no different than Create Space? Well, you’ve made it! At this point I think I’ve shared all my wisdom :) on publishing your own book. Know that you can do it! If you’re inspired to write a book, go for it! Publishing our book reminded me of being pregnant and giving birth. It’s this long, long process and you see slow progress along the way. Then you come to the final steps of finishing things and actually getting it published. Like labor, you think it’s never going to end! But then it does and you have sometime beautiful. Ok, maybe not the best example, but you’re moms so I thought it would be a good analogy. Do you have any other questions? I would love to try to answer them! Please leave your questions in the comments below. So this was totally my own experience, so make sure you check things out with Create Space so that you understand everything before you publish your book. While I feel like I’ve talked forever, there is still tons of details that I could have missed.